Richard Weisenburger was born November 11, 1925 in Tuttle, ND, the son of Peter and Helena (Rath) Weisenburger. In 1932 Richard’s family moved to a farm near New Rockford, ND. On August 28, 1949 Richard was united in marriage to Vonnie (Fleming) at the Evangelical United Brethren Church in New Rockford. They lived and farmed in Rosefield Township. Richard brought Rural Water to the area. Richard worked at the Carrington Irrigation Station for many years in addition to farming his land. He served as President on the New Rockford School board for many years and also on the Credit Union Board. He was very active in the United Methodist Church holding many different church offices over the years. He was a very faithful and active member of the church until its recent closure, upon which time he attended the Congregational Church of New Rockford. He was an avid hunter and loved fishing. In his later years he took to golfing, which he also enjoyed. 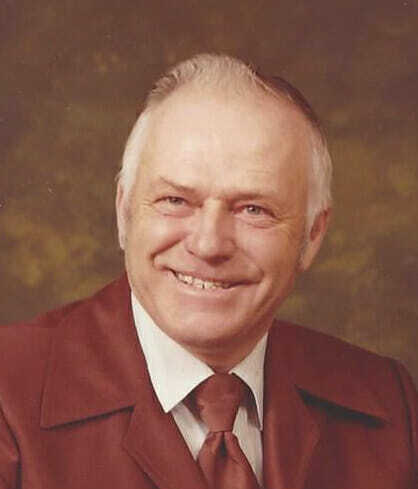 Richard went to be with the Lord on February 8, 2019 at the Lutheran Home of the Good Shepherd in New Rockford, ND, at the age of 93. He is survived by 6 children; Luann (Dennis) Rimmereid of New Rockford; Peter (Joy) Weisenburger of Clifton, Texas; Steve (Sharon) Weisenburger of New Rockford; Michael (Melanie Porter-Burke) Weisenburger of Laramie, Wyoming; Kenneth (Mary) Weisenburger of Mendota Heights, MN; Brenda (Wesley) Schumann of Dickinson, ND; 20 Grandchildren; 23 Great Grandchildren; and a sister, Agnes Stilwell, in California. Richard was preceded in death by his parents; his wife Vonnie; three brothers, Bert, Albert and Ray; and five sisters, Lydia, Annie, Alvina, Emma, and Lorraine. Visitation: will be Monday from 12PM-7PM with a prayer service at 7PM all in the Evans Funeral Home, New Rockford, ND. Funeral Service: will be held Tuesday, February 12, 2019, at 10:30AM in First Lutheran Church, New Rockford, ND. Burial: will be held at the Prairie Home Cemetery, New Rockford, ND. We want to send our deepest sympathy to the Weisenburger family during their time of loss. Ken has told me many stories of their fishing outings, the funniest being a few years back ice fishing when their ice house blew away. It’s those memories that will make it a little easier. Our thought and prayers go out to you all. Great guy. Sorry the funeral will be held when we are gone. To all the Weisenburger family I send my thoughts and prayers out to you. God bless you all in this time of sorrow. I was sorry to hear about Uncle Richard’s passing. He was such a wonderful uncle. We always used to look forward to getting together with Aunt Vonnie and Uncle Richard and the whole slew of cousins. Oh the adventures and trouble we found! Dad and Uncle Richard would smile quietly while Mom and Aunt Vonnie cleaned up the mess we had created! I will always remember Uncle Richard with fond memories and he will forever be in my heart. Praying for all the family during this tough time. Sorry to hear of Uncle Richards passing – sending thoughts and prayers to to you all in this time of sorrow. Thoughts and prayers on behalf of the family are being sent to our Heavenly Father. God sustains His children during time of grief & loss. To the Weisenburger Family, thoughs and prayers to you as you celebrate the life and accomplishments of Richard. Thoughts and prayers to the families in the loss of this remarkable man. Many were blessed to have known him. May his memory sustain and comfort you. God Bless. Uncle Richard was a great guy. He and my Dad, Gaylen Fleming spent a lot of time together hunting and fishing and playing jokes on each other. I always enjoyed talking to him and hearing all of his stories. I will always have fond memories of him. Sorry to hear of Uncle Richards passing – sending his family loving thoughts and prayers in this time of sorrow. May God bless you all. Blessed are those who mourn, for they shall be comforted Matthew 5:4. Our thoughts and prayers go out to our cousins, the daughters and sons of Uncle Richard. Wishing we would have been able to be there to share in your celebration of life. Our condolences to all in your loss of such a wonderful man. Rejoicing with you as he joins his family gone before and his Lord and Savior. I cherish fond memories of Richard in our brief time in New Rockford. He was a blessing to our church family there. To the family of Richard—Thoughts and Prayers, rest in peace sir….